Which timber issue is present in your property? Whilst the timber rots produce fungi and require elevated levels of moisture, woodworm only require timber which has a relatively low level of moisture, caused by condensation, temperature variance or in areas which are shut off. Winter, spring and autumn are the most likely months for property owners to suspect a woodworm infestation. Woodworm don’t enjoy summer heat and the resultant drying out of timber, but they do not die off. To determine whether your premises has a timber rot or woodworm issue, it is always best to contact woodworm specialists, like the team at Thames Valley Timber Treatment who carry out thorough professional surveys and are confident discerning the true cause and current threat of a timber problem. Can you see a live beetle infestation? Are there concentrations of dead beetles below a piece of timber? 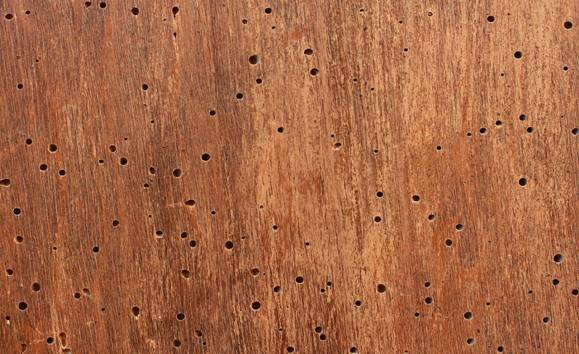 Are there fresh-looking holes in wooden furniture, beams or boards? *Holes can appear fresh even when they are from a historic infestation. Has dust settled beneath the holes? This is frass. Do the holes lead to tunnels, known as galleries? Can you see eggs? This is very difficult without magnification. Is timber weak, crumbling or easy to damage? Does any of the timber have a history of woodworm infestations? They are the larvae and pupa forms of wood boring beetles. There are several species including the Common Furniture Beetle and the Death Watch Beetle. The female lays her eggs in the crevices of wood, these hatch as larvae and burrow immediately into the adjacent timber. Woodworm then live for 2-5 years as larvae and pupa, they feed on the natural cellulose content in the timber to survive, tunnelling as they explore for food. When they reach maturity, they become beetles and tunnel out of the timber. They spend less than 2 weeks alive as adults; their sole purpose is to mate, and they die after this has been achieved. Mortgage and insurance companies, health and safety and maintenance agreements often indicate that only professional woodworm treatment is sufficient to meet criteria. Professional woodworm treatments are licensed, administered in line with the severity of the infestation and have guarantees of 20-30 years. Peace of mind can only be sourced via experts. Woodworm specialists appreciate that woodworm don’t migrate habitually, so if one timber is infested this does not necessitate woodworm treatment for every timber, reducing the hazards to humans and animals. Whilst easy to use over the counter woodworm killers may seem like an attractive alternative to hiring woodworm specialists, if these woodworm treatments were 100% effective, why would specialists train and provide pest control? Contact Thames Valley Timber Treatment’s team today for woodworm treatment advice.